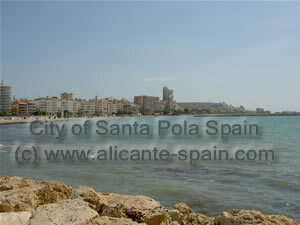 Santa Pola lies just twenty kilometres south of Alicante and is very easily reachable either by car on the National highway N-332 or by air when landing at the Altet Airport just 15 kilometres away. 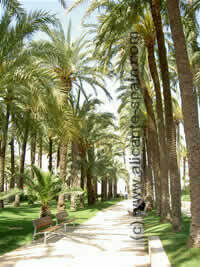 Santa Pola quickly takes you back to Roman times. It was here where the Portus Illicitanus, the Roman ruins, were found. The Roman House of the Palmeral which was built during the Low Imperial and the Roman factory for pickling and salting fish from the 4th century B. C. are also clear signs of this era. 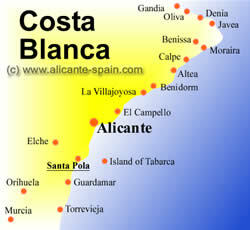 It was a most prosperous fishing village on the Costa Blanca, but today all of this has been overtaken by tourism. Santa Pola extends and hugs both side of the Renaissance Castle-Fortress built in the 16th c. to defend itself from the pirate attacks. This building is found in the city centre and has a very strict military appearance. It houses the magnificent Archaeological Museum where you can feast your eyes and admire Iberian and Roman findings. Along with this, the Fishing Museum with a rich selection of maritime objects and a fascinating aquarium . But why should you just have to look at this interesting world, why not participate. One of the most remarkable attractions is the auctioning of the fresh fish that arrives on the fishing boats every afternoon. To enable anyone and everyone to have access to see and buy, there is a permanent fish market next to the main building. It is quite a show! From the same time period three watch out tower are still standing ; the Atalayola, the Tamarit and the Escaletes. As you leave the fortress, a nice place to take a breather and maybe a few tapas ( typical side dishes) would be in the Plaza de la Glorieta ( Glorieta Square), surrounded by terraces and lovely gardens. Continuing on with your leisurely stroll heading towards the higher part of the town, you promptly arrive at the Plaza del Calvario where you will enjoy a impressive panoramic view. On the outskirts you must visit the Salinas de Santa Pola (salt mines) in the natural park where you can get information and book a date for your visit. You will be graced with an incredible view of flamingos (reaching over 3000 at the end of summer) and two very unique kinds of ducks among others. And if this is not enough, then just head for one of the rolling sandy beaches like the Varadero, the Levante or the Gran Playa for a relaxing stay and an incredible climate almost all year round.From here you can also catch a ferry to the small by interesting island of Tabarca. But there are also other places not far away and easily reachable by car, train or coach like Benidorm with its great variety of restaurants and discotheques. 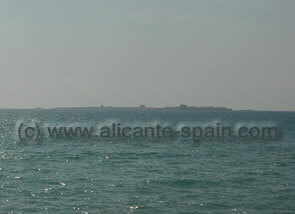 Altea is just a little further north and very picturesque with its blue tile roofed cathedral and nautical port. And Calpe with its beaches and restaurants where you can choose your own fresh fish menu. You may be thinking that all this is going to be very expensive, but Santa Pola has learned to cater to its visitors, young and old. Economical hotels that even allow dogs like Michel. Medium priced which are comfortable, air-conditioned and an excellent restaurant like Patilla. Luxury for those who have done a good job at saving. Nice garden and good service at Rocas Blancas. Anywhere you go on the Costa Blanca, at almost any time of the year, but especially in the summer, you will be pleasantly surprised at what specialties await you.